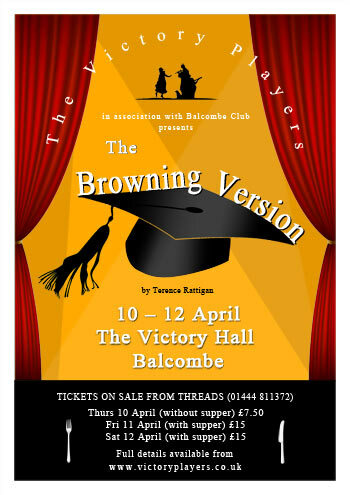 Last week audiences in the Victory Hall, Balcombe, enjoyed the latest production by the Victory Players. Terence Rattigan’s The Browning Version is a “tragicomedy” set in an English Public School in the 1950’s. Andrew Crocker-Harris (played by Philip Robinson) is an embittered and unpopular master who has taught Greek and Latin at the school for nearly 20 years. Poor health is now forcing him to retire early. The boys regard him as a tyrant, with some justification. His wife Millie (Nicola Preston Bell) is unfaithful, and contemptuous of her husband. Andrew must come to terms with his failed life and regain at least his self-respect. Philip Robinson, a new member of the Victory Players, seemed completely at home in the role, as though he had spent his entire career teaching Greek and Latin at an English Public School, which indeed he had! A two course supper prepared by Chris and Julie Walker was served after the Friday and Saturday performances. The audiences left the Hall with both their intellects and their appetites satisfied.